The retired co-founder of the Lakewood law firm, which specializes in estate planning, is attempting to force the firm into bankruptcy. Buchanan filed a Chapter 7 involuntary petition last week against Buchanan & Stouffer. In court documents, he claims the firm owes him $238,173. Chapter 7 bankruptcies are typically a liquidation process, where a trustee is appointed to oversee a selloff of the debtor’s assets. Most bankruptcies are voluntary, and initiated by the individual or business declaring bankruptcy. Creditors, however, can attempt to force a business into bankruptcy through the involuntary petition process. Buchanan & Stouffer’s website lists seven attorneys, including Buchanan, who the website said is retired. In addition to its office at 198 Union Blvd. in Lakewood, Buchanan & Stouffer also has an office in Durango. Buchanan did not respond to requests for comment. 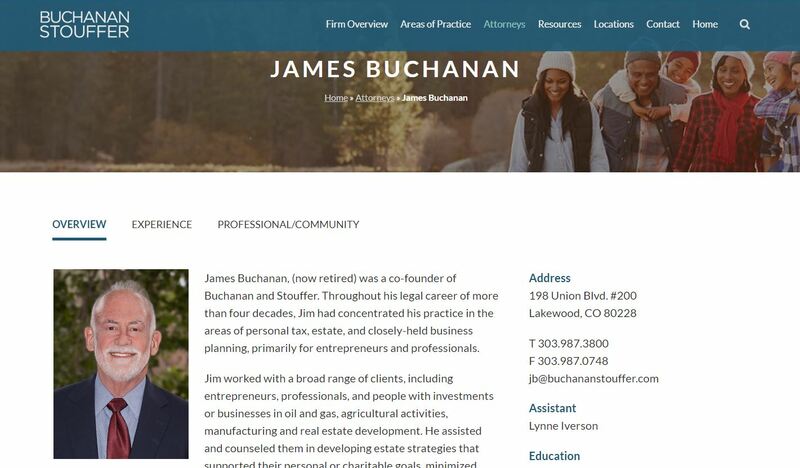 Firm Managing Partner J.P. Buchanan also did not respond to requests for comment. Attorney Jeffrey Weinman, of Denver’s Weinman & Associates, is representing Buchanan in the proceedings. He did not return voicemails.